With SkinJect, the needles are the drug. The device comprises a dissolvable microneedle array (MNA) to deliver a drug directly into the top layer of skin. The drug will kill non-melanoma skin cancer by causing an immune system reaction to combat the disease. Dissolvable microneedles that penetrate the skin, dissolve and deliver the “cargo” − the drug. 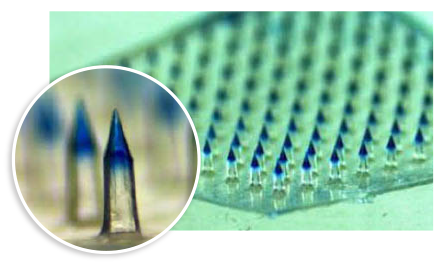 A cellulose-like material that forms the microneedles and carries the cargo. It is FDA-approved for human use. A chemotherapy cargo that kills cells and also stimulates an immunological response from the patient’s lesion. Also FDA-approved for human use. While SkinJect’s primary indication will be to treat and prevent basal cell carcinoma, its other uses include treatment and, possibly, the prevention of squamous cell carcinoma and actinic keratosis. One topical application per week during a 10 minute office visit over the course of three weeks. Its efficacy is expected to be as good as or better than Mohs surgery and other therapies. Minimal local irritation is anticipated. Recurrence of the lesion at the site of treatment may be preventable due to stimulation of the patient’s immune system. © 2019 SkinJect. All Rights Reserved.